PME Diploma Courses & Masters Certificate are internationally recognised awards. 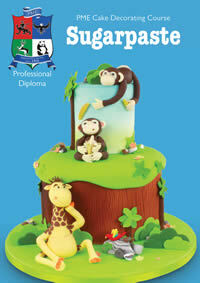 They are ideal for those thinking of selling cakes either to family and friends, as a commercial business or for anyone who would like an official qualification for their skills. There are 3 modules and each module includes at least 25 hours tuition covering a broad range of skills and techniques. On successful completion of each module and attainment of the required standard, the Diploma certificate is awarded. Each module is a separate course and students can choose to take an individual module or two or all three as they wish. Techniques and skills covered do not overlap between modules. Students that successfully gain their diploma certificates in all three modules are awarded a Masters certificate. Instalment payments are available for these courses (please ask for details). For students completing all 3 modules with us, we are pleased to offer a 10% discount off of the course fee for the final module which will be applied at the time of paying the final balance for the third module. This module is combination of basic techniques and creative styling with a professional business approach. 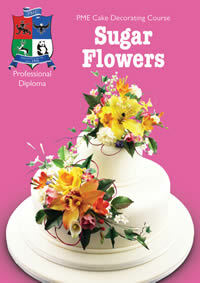 There are 3 modules: Sugarpaste, Royal Icing & Piping and Sugar Flowers. Each course is individual and students can complete one, two or all three modules as they wish in any order. A module diploma certificate is awarded after each successfully completed module. The student must attend all sessions of the module and attain a reasonable standard of work for diploma certificates to be issued. 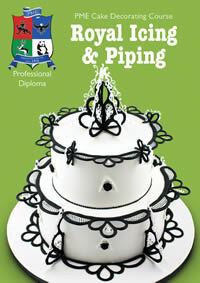 Diploma certificates are issued at the discretion of the approved tutor. On successful completion of all three modules students will be awarded the PME Professional Diploma Masters certificate. Each module consists of at least 25 hours tuition and can be structured over 5 sessions of 5 hours or 10 sessions of 2.5 hours. Students must attend all sessions to be awarded the diploma certificate. The Course Book specific for each module for you to keep. A Course Kit including approx £100 worth of PME tools and equipment for you to use on the course and keep afterwards. The student is not normally required to bring anything to the courses although in exceptional circumstances, if the student is required to bring something along sufficient advance notice and information will be provided. Tea, coffee and biscuits and bottled water will be available for students throughout the course. In some cases students will be asked to bring a packed lunch with them (see specific course information). For PME Professional Diploma courses a £100 non-refundable deposit at the time of booking to confirm the place on the course. The balance is due no later than 2 weeks before the course start date. Celebration Cakes reserve the right to sell the student’s place on the course if the balance payment is not received 2 weeks before the course start date. Deposits & payments cannot automatically be transferred between PME Professional Diploma modules as with other courses. Requests to transfer payments will be dealt with on a case-by-case basis. For students completing all 3 modules with us, we are pleased to offer a 10% discount off of the course fee for the final module which will be applied at the time of paying the final balance for the third module.